Boxing Day 2004 brought first hand in to the homes of people world wide, mainly by T V, the full horror this event. 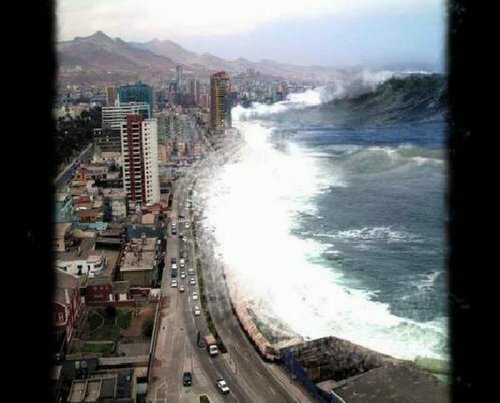 The Indian coastline experienced the most devastating tsunami in recorded history. The tsunami was triggered by an earthquake of magnitude 9.0 on the Richter scale at 3.4° N, 95.7° E off the coast of Sumatra in the Indonesian Archipelago at 00:59 hrs GMTor UTC. Lions Clubs International was swift to respond pouring money & aid into the area. In the last 72 hours, $170,000 in LCIF Emergency Grant funds have been dispatched to Lions districts in India, Sri Lanka, Thailand and Indonesia to help the Lions provide food, blankets, water and other relief items. There are 73,000 Lions in the hardest hit regions of India, Sri Lanka, Thailand and Indonesia on the spot, coming to the aid of those in need. They are working in the affected communities, as well as coordinating with the government at national levels. In Sri Lanka, the Lions have formed a joint commission with the government to expand the country’s response in dealing with the critical issues of shelter, water supplies and sanitation. In India, the hardest hit districts in and around Chennai have also come together to coordinate the expenditure of US$50,000 in LCIF funding awarded for districts that cover the coastline from Tamil Nadu north to Orissa. For Lions wishing to help support these efforts, LCIF has created a special designated fund, the “South Asia Tsunami Disaster 2004 Fund,” to receive donations that will be forwarded on to the affected areas. This fund will complement funds already awarded. Funds will be used to support both immediate and long-term needs of the victims. Already Lions around the world are making pledges of support, including US$120,000 from the Lions of Sweden and US$200,000 from the Lions of Korea. Lions and others interested in supporting this special fund can do so by making a donation to LCIF. In North America, checks can be sent to LCIF. In other countries, funds can be sent directly to the LCI or LCIF accounts. In both cases, a cover note or memo on the check/deposit slip should indicate that the donation is for the “South Asia Tsunami Disaster 2004 Fund.” You may also contact your district’s LCIF chairperson for more details on making donations to LCIF. If you have any questions, please contact lcif@lionsclubs.org. LCIF will continue to keep you updated through these bulletins. More funds will be awarded by LICF in the coming days as needs are assessed. Your support is needed to help Lions of the world respond to what is the world’s largest catastrophe in modern history. The tsunami disaster in South Asia prompted a tremendous outpouring of support from Lions around the world, and Lions in the affected countries are working day and night to bring life-saving supplies to victims. Thanks to Lions, lives are being saved and communities will be rebuilt. LCIF has awarded US$470,000 in grants to Lions in India, Indonesia, Sri Lanka, Thailand and Malaysia. This includes US$220,000 in emergency grants for Lions to secure and deliver food, water and blankets and a US$250,000 major catastrophe grant for longer-term relief. Following is a more complete account of the relief efforts of LCIF and Lions. You will be proud to learn of how important Lions have been and perhaps be even more motivated to offer your support. On behalf of Lions of South Asia, I humbly thank you for your interest and compassion. LCIF Tsunami Relief Update Lions in Action Supported by LCIF, several thousand local Lions are now providing immediate relief aid such as food, water and clothing from the west coast of India to Thailand and south to Indonesia. Local Lions in hundreds of places are at the scenes of the disaster, helping to organize relief and ensuring that people get vital relief supplies. Lions from nearby nations also have sent volunteer workers. The Taiwan Lions, for example, sent a medical team to Sri Lanka. The service of Lions is enabling communities to take care of their children, elderly, those with disabilities and other especially vulnerable people. In Sri Lanka, Lions are working 16-hour days in organizing relief aid and are a key partner of the government’s relief agency and of the country's president. Enhancing their ability to assist in the relief, Lions hold key positions in the community. The former president is a Lion, as is the current Minister of Housing. District 306-B sent 60 truckloads of food and supplies to several relocation camps. Lions receive police escorts for the deliveries. District 306-A is organizing the installation of tents at new relocation camps in southern Sri Lanka at the government's request. In Indonesia, Lions are contributing greatly to relief efforts in some of the hardest hit areas. Thirty clubs near Medan provide logistical support for aid shipments to Bandh Acheh and send out four trucks of materials daily. They also are providing shelter, food, and clothing to refugees who have entered Medan. Lion-doctors from Jakarta and Medan are providing medical treatment. Lions also are making preliminary plans to support the educational needs of orphans. In India, 20 Lions’ ambulances and a team of 80 Lions volunteer medical doctors are providing first aid near Chennai. Nearly 70 clubs fanned out in the region from Parassalla to Haripad to distribute food and clothes at the relief camps. Lion-doctors conducted free treatment at relief centres. In Thailand, Lions in Bangkok have sent water tanks and trucks loaded with supplies to Phuket. Lions are working with government officials and relief agencies to provide for basic needs at relocation camps. By coincidence Lion Brian had a slot on BBC Radio Coventry & Warwickshire, & was able to explain locally what was happening. Attention was directed to the infamous Phucket Wave picture (left of the 3 on this page) with a link from the BBC website. Whilst the majority of opinion claims the picture be a hoax in poor taste, it had the effect of raising the right emotions at the right time time. I am happy to report that LCIF and Lions are making great progress in helping victims of the tsunami in South Asia . As you may recall, LCIF mobilized US$15 million for relief and reconstruction. Our plan was to construct suitable, sturdy and comfortable homes, as well as schools, health clinics, hospitals, water wells and child welfare centres. Here is a progress report on the four nations in which local Lions are engaged in reconstruction. In Indonesia , LCIF has disbursed US$418,375. The Indonesian Lions Tsunami Committee has successfully established two Lions Villages in Aceh Province . LCIF has funded 320 homes with electricity, village restrooms and six deep-water wells. Upcoming projects in Indonesia include economic revival activities in the Lions villages and housing for tsunami victims in Banda Aceh, the capital. Along with Past International Director Barry Palmer and an LCIF staff person, I recently traveled to the Lions Village in Seunuddon to check on 200 Lions homes there. I can tell you that the Lions did a great job of building these homes and that the occupants are extremely grateful to the Lions. Families have a roof over their heads and are enjoying a sense of normalcy again. The smiles on their faces when meeting Lions tell all you need to know about how effective Lions and LCIF have been in South Asia . In Sri Lanka , the Lions plan to build 318 homes at five locations at a cost of US$1.25 million. In the Western part of the island, 40 homes will be built at Modera/M’kuliya, Colombo , and 70 homes at Bandaragama, Panadura. In the South, 20 homes will be built at Dodangoda, Kalutara. In the East, 105 homes are planned for Kuchhaveli, Trincomalee, and 83 homes are slated for Pothuvil, Ampara. In July 2005, LCIF staff visited Sri Lanka to inspect initial tsunami reconstruction work and LCIF disbursed US$412,500 in September to get the building started. The Sri Lankan Lions are expected to request additional funding to build more homes. In Thailand , LCIF has disbursed US$702,583. The Thailand Tsunami Committee is overseeing the construction of 195 homes at two Lions villages on two separate islands. The first village on Lanta Island is scheduled to be completed in December. In India , the Lions MD-324 Tsunami Disaster Relief Committee presented a US$1.25 million plan to build homes, community rehabilitation centres, potable water facilities, primary health enters, schools and an orphanage. The majority of resources will be directed toward the Lions districts on the East coast from Chennai to Nagapatinam that were most affected by the tsunami. LCIF staff visited India in July to meet with key Lions, and LCIF disbursed US$412,500 to the Relief Committee in September so that it could begin reconstruction work. Our reconstruction work in South Asia is helping thousands of people with little means get back on their feet and resume their lives. We will help thousands more in the near future. Thanks to the generosity of Lions worldwide and the untiring service of Lions in South Asia , people who suffered the wrath of a natural disaster are starting over with a new home and are making the most of their opportunity. 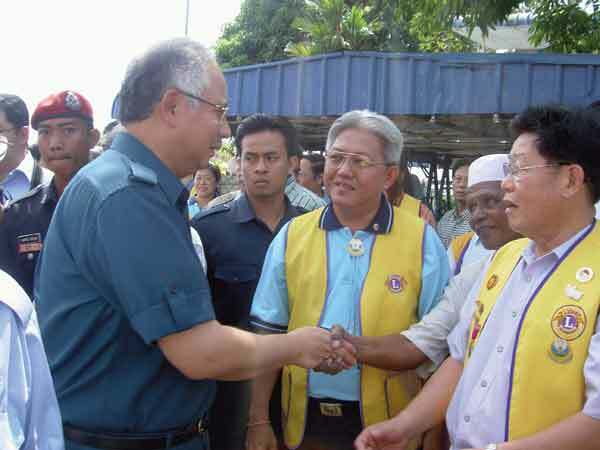 Internationally aid & assistance is still being given by Lions Clubs to help rebuild lives.